Real estate changes keep coming to Boston, not only in new construction, but also an assortment of renovations planned throughout the Seaport submarket. One notable update is slated for The Seaport Word Trade Center, which is poised to add 30,000 SF of retail space to its existing 804,000 SF footprint. 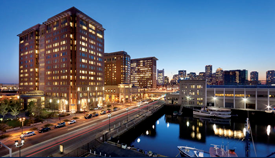 Among the intended modifications to Seaport World Trade Center are “plans to close Commonwealth Hall, an existing exhibition space at the Seaport World Trade Center, and create new conference and event facilities at the Seaport Hotel,” a recent article on the BBJ notes. Further details on the expected renovations are available on the Boston Business Journal. Tagged 245 Summer St., Boston real estate development firms, Commonwealth Hall, Fidelity, Seaport Place, Seaport Retail Space, The Drew Co.